We don’t usually think of Isis in relation to crocodiles or to Sobek, the Crocodile God. Ahh, but wait. As with so much in Egyptian religion, it’s complicated. And there are more Isis-croc connections than we might at first think. Let’s start with a bit about the crocodile itself. A Nile crocodile can reach up to twenty feet in length—and it doesn’t care what it eats. In addition to their usual diet of fish, the Nile crocodile is happy to feed on birds, wild and domestic animals—and human beings. 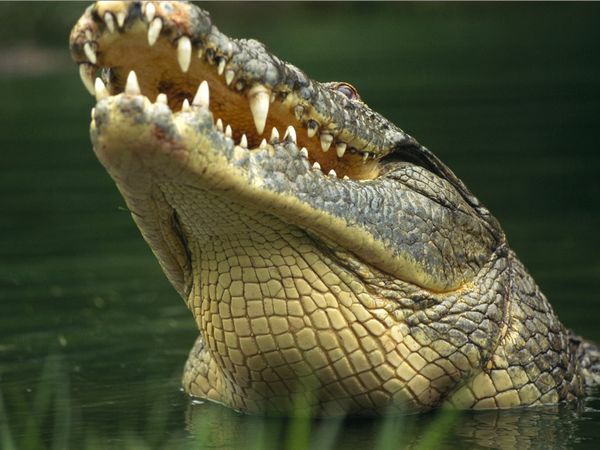 Estimates are that as many as 200 people a year are killed by crocodiles. Crocodiles catch their prey in huge, toothy jaws and drag it underwater until the struggling stops. It is no wonder Egyptians ancient and modern fear the beast. Perhaps that fear explains why the Nile crocodile was hunted nearly to extinction in the 1940s through 60s. Today, however, they have rebounded and are no longer in danger. The image of the strong, voracious, and fierce crocodile appears in Egyptian art beginning in prehistoric times. Yet, they are shown both as devouring monsters and as protective guardians. Ammut, Who waits to devour the dead who fail the judgment of Osiris, is part crocodile. Yet magic wands designed for protection often include images of crocodiles. A protective amulet called the Cippi of Horus showed the Son of Isis standing upon the backs of two or more crocodiles and holding dangerous serpents harmlessly in His hands. Powerful magicians were fabled to be able to ride across the river on the backs of crocodiles. Yet most people wanted to repel crocodiles. Numerous magical formulae have been found that were uttered to keep the frightful creatures at bay, many of them including the important words, “Get back, crocodile!” Jokingly or seriously, I have used that spell on the road when another vehicle comes way too close. The crocodile was a presence in the Egyptian world that simply could not be ignored. And as the God Sobek, the Egyptians gave Him His due. Sobek is a Water God and thus associated with fertility. There was a common folk belief among the ancient Egyptians that when many crocodiles were seen in the Nile, the flood waters of the annual Inundation would be deep and, as a result, the harvest would be abundant. Sobek is also connected with original creation; for as the crocodile rises up out of the Nile, so the primordial Sun arose from the waters of chaos. Because of this solar connection, Sokek is frequently seen crowned with the solar disk. The God’s major centers of worship were at Kom Ombo, upriver from Philae and Aswan, and in the Faiyum, a large, especially fertile oasis in Lower Egypt, southwest of Cairo. We also have some evidence of His cult in Memphis, perhaps within the Ptah temple complex. When the Faiyum temple of Medinet Madi was unearthed, some of the first things they found were four lengthy praise hymns to Isis as universal Goddess, in Greek, and written by Her devotee, Isidorus. In these hymns, Isis is understood to be many Goddesses, including Isis-Thermouthis or Hermouthis. This is Isis assimilated with the Cobra Harvest Goddess Renenutet. In the Faiyum She is paired with Sobek. In one of the hymns to Isis from Medinet Madi, Sokonopis (“Sobek of the Nile”) is called “Agathos Daimon (“Good Spirit”),” “mighty,” and “that goodly bestower of wealth, creator of both earth and starry heaven, and of all rivers, and very swift streams.” Two other Isiac consorts, Serapis and Osiris, are also called Agathos Daimon. Like Sobek, both Serapis and Osiris are associated with water and especially rivers. Serapis is connected with a miracle in which pure water is produced from salty. Osiris is the living water of the Nile Inundation itself. 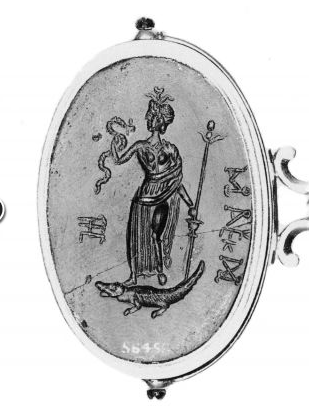 Isis-Thermouthis and Sokonopis were considered healing Deities, an ability that may have accrued to the Crocodile God from His association with Isis, the Healing Goddess. The Crocodile God was said to have assisted Isis in healing Osiris. 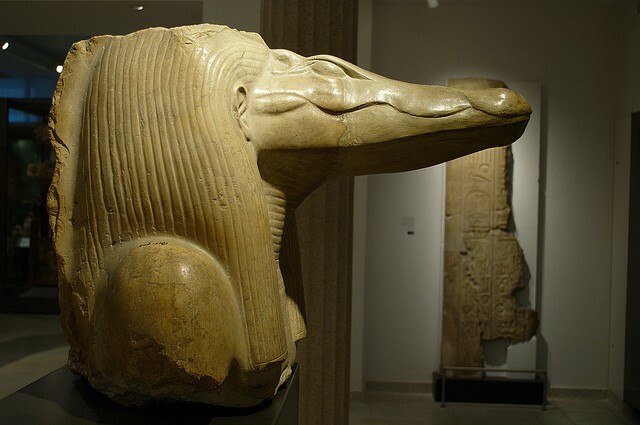 In fact, there are a number of representations of a crocodile bearing the Osirian mummy on its back. 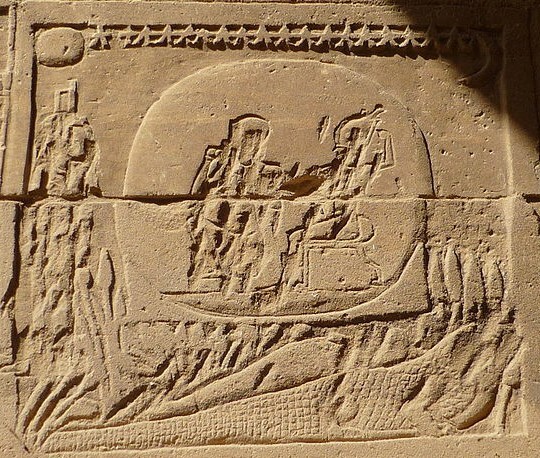 One of these is from Philae, where Isis is shown standing at the feet of the crocodile-carried Osiris. This idea surely came from the fact that mother crocodiles will sometimes carry their young on their backs to protect them from predators. Plutarch relates an Egyptian tradition that, out of fear and respect for the Goddess, crocodiles will not attack people traveling in papyrus boats because Isis traveled in such a boat as She searched for the parts of Osiris’ body. Isis’ association with the crocodile continued long after the end of ancient Egypt. There is a famous work called The Faerie Queene, written by the Elizabethan poet Edmund Spenser. Spenser is writing in support of his monarch, Elizabeth I. In his story, the heroine finds herself in Isis Church and has a vision of the Goddess. At first, she sees herself as a votary of Isis, later she becomes Isis Herself. A crocodile threatens to destroy the Church, but our heroine, as Isis, drives it back. Tamed, the beast now seeks her “grace and love.” Literally. For the crocodile mates with her/Her and she/She gives birth to a lion. A priest at the Church explains that the crocodile is Osiris and their lion-child will be a just king. And so we see that Isis and the crocodile are much closer than it might at first seem. Like the Goddess Who, in Her dark and bright aspects, can be both frightening and comforting, the Crocodile God Who is Her Faiyum consort can be fearsome, as well as a protector, healer, and a giver of wealth. When it comes to Goddesses and Gods, it’s definitely complicated. Aspects of IsisCrocodileDeitiesEgyptian TemplesFaiyumGod SobekGoddessGoddess IsisIsisIsis MagicLady of MagicPagan SpiritualitySobekWho is Isis? In one of those (common) synchronicities in my developing relationship with the Lady Isis, I happened to be flipping through TV channels yesterday and landed on a program on Animal Planet about crocodiles. The man being interviewed was one of the few naturalists who has been privileged on more than one occasion to witness crocodiles mating in the wild. As he described it, his voice took on a beautiful quality full of loving reverence for the wonder he had witnessed. According to him, the mating of crocodiles is a slow, gentle process that involves the male approaching the female gently, stroking her head with his head and other parts of her body. Only after this sweet courtship does the female signal her permission to mate, and then that mating takes place by the male gently encircling her body. That description so aptly — for me — approaches an experience of the love of Isis. And then today, here is your amazing and erudite piece about crocodiles and the Lady. And, by the bye, I’m reading the 10th Anniversary edition of Isis Magic, and I am so very grateful to you for this wonderful book. I had to stop highlighting in my copy because every page was drenched in yellow. You have such a gift for manifesting thought and gnosis onto paper!!! Isis and crocodiles and Sobek and Faiyum and Thinky Thoughts. Oh yes. Best way to start my morning reading.